With PAX Australia just weeks away, news about what to expect on the stand is arriving every day. Taiwanese computer behemoth Asus is the latest company to outline its presence at the show, with a collection of high-end gaming PCs on offer. The centrepiece of the Asus offering at PAX will be the ROG Tytan CG8890 gaming desktop, which features a one-click overclock button of the 6-core Intel Core i7-3960X processor with Turbo Gear that doesn't require rebooting. Also packed into the behemoth machine will be 10-way venting, a liquid-cooled CPU and a four-screen display with GTX690 graphics and Asus' Xonar audio. 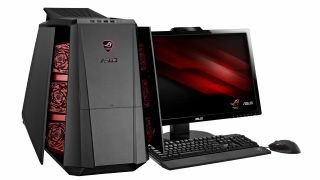 If the CG8890 sounds like overkill, Asus is also showing off its new Tytan G30 machine which includes the one-click overclock of a full-core Core i7 processor with Turbo gear without the need to reboot, as well as a GTX680 graphics card powering a four-screen setup and inbuilt lighting controls to change the colour to red when overclocked. Both machines are being shown in Australia for the first time at the show, which should be enough to entice the hard-core PC gamer to the company's stand. Asus is also powering the World of Tanks competition, with 20 high-end machines built around the latest Haswell chipset.